Electronic parts are used throughout industry to run everyday products, such as cell phones, and also highly technical products, such as aircraft, missiles, and spacecraft. Unlike cell phones, which are often replaced every year, the highly technical products may remain in service from 20 to more than 80 years. But what happens if the original electronic part, with a life cycle of 18 months, is no longer available? Some manufacturers have discovered that they have unwittingly purchased counterfeit ones. Counterfeit Electronic Parts and Their Impact on Supply Chains examines how these items are negatively affecting the aviation, spacecraft, and defense sectors and what can be done about it. As the inflow of counterfeit electronic parts does not appear to be slowing down, Counterfeit Electronic Parts and Their Impact on Supply Chains investigates the possible solutions to combat the issue, including legislation and standards, and other solutions that are government driven but that may be impacted by continuing budget cuts. The book also presents a high-level compilation of supply chain best practices identified in a survey of electronic parts manufacturers and government contractors. 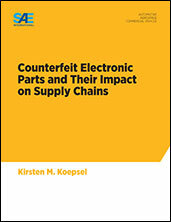 It is a must-read for those interested in a comprehensive review of the challenge of counterfeit electronic parts and the consequences of their use in both consumer and industrial products. If you do not have access to SAE MOBILUS via username/password or institutional access, you can still purchase the Book, Counterfeit Electronic Parts and Their Impact on Supply Chains.